Robert Mueller, the head of the Special Counsel investigation of Russian interference in the 2016 United States elections, broke Former National Security Adviser’s spirit. Michael Flynn decided to testify against Donald Trump in order to save himself from going to jail for defending the US and Israel’s interests. Robert Mueller managed to force ex- National Security Adviser to give testimonies that the anti-Trump establishment needed. The fact that Flynn’s “confession” is absurd bothers nobody. Trump’s possible impeachment made the American establishment think that the main thing is not what they say, but how the media delivers it. One of the media that presented disgracefulFlynn’s testimony was ABC News. The News channel said that Flynn promised ”full cooperation to Mueller’s team” and testify that Trump during hispresidential campaign “to find ways to contact with Russia”. However, the truth is that saving himself from prison, fines and other troubles, Flynn really agreed to cooperate with Mueller’s “bonecrushers”. But people remembered only a monstrous lie: Trump asked Flynn “to find ways to contact Russians” and this request was during his presidential campaign before the election. Using this statement, they tried to prove that fact that Trump cooperated with Russians and thus there was a kind of “proof” that Russians had influence on the US election. People have been convinced that Russians made Trump a president. Later, ABC news “corrected” this “information”: Trump asked Flynn to connect with “Russians” when he was a president, right after his election. This fact changed absolutely the situation but the first version had already stuck to people’s mind. And it was enough to prepare society for the presidential impeachment. But this was not the whole truth. It turned out later that Trump did not give Flynn any instructions at all. The initiative came from the president's circle. Moreover, Mueller "exposed" Flynn on the basis of his telephone conversations, illegally recorded by the US special services, with the former Russian ambassador to the US Sergei Kislyak. However, these telephone conversations were not supposed to present in court as any kind of evidence. It is clear to see how absurd charges against Trump and his circle are. The general "confessed" that he was instructed to persuade Moscow not to reciprocate in expelling 35 Russian diplomats from the US and not to take countermeasures against the American diplomatic property in Moscow. Russia agreed with the USpresident and did not react to anything for six months as there was hope to settle this conflict. Also, Flynn was asked to convince Moscow to stand up for Israel’s intersts, so that Russia "postponed or froze" the adoption of the UN Security Council resolution condemning Israeli settlement activities in the Palestinian territories. This request was not carried out simply because it was inmpossible. And, finally, Flynn is accused as a crime that he discussed with Kislyak the prospects of a joint struggle with the most odious terrorist organization in the world - ISIS. That's all. There is no crime in it. These phone conversations under the control of the US intelligence services took place before Trump became president of the United States , and they are explained only by the fact that the new president's team did not want to start from scratch and had to solve the situation that Obama’s administration left them. But this is how the prosecution looks at this. Mueller’s team say that Flynn admitted in his plea that he lied to the FBI about several December conversations with Kislyak… that, on December 29, he did not ask, the Russian ambassador not to escalate the situation regarding the U.S. Sanctions. Also, they say that Flynn lied when he said, on December 22, he had not asked the Russian ambassador “ postpone or block” " the UN Security Council's adoption of a resolution directed against Israel's interests, as if this country were hostile to the USA. Everythingwasturnedupsidedown. This is how modern American justice works: a person is charged with monstrous accusations that lead to a few lifetimes in prison, and then they are offered to cooperate with the investigation and admit what the investigators want in order to get a more modest punishment. What is Flynn’s real guilt? The truth is that the only thing that you can blame Flynn is his lobbying activity, which the half of Washington does. 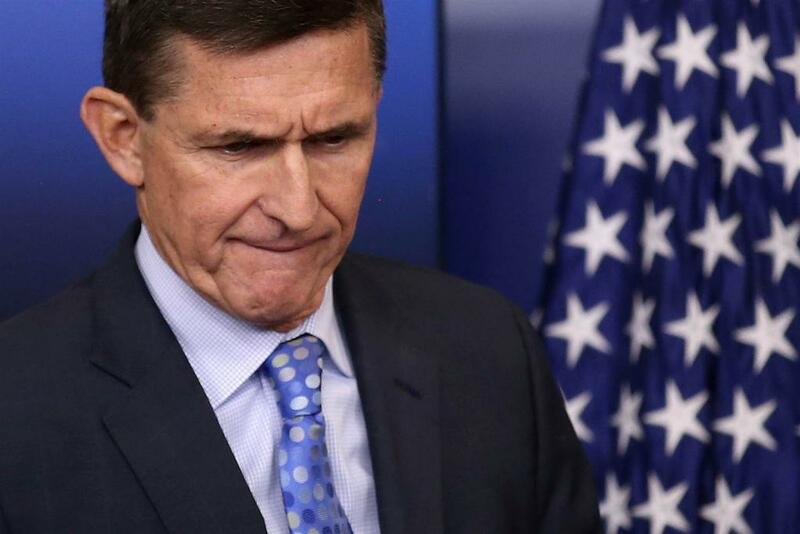 The investigators therefore managed to persuade Flynn to cooperate, that they were interested in his lobbying contracts with firms from Saudi Arabia, Russia and Turkey. In the latter case, he made a very serious mistake. He agreed to consider the extradition FethullahGülen, the long-established US agent of the CIA and the enemy of Turkish President Erdogan, to the Turks. As it was reported, the Turks made this a condition for concluding a major deal in the energy sector, which is also extremely beneficial to Israel, which Flynn "pushed". The CIA was very upset at him for this: if valuable agents are givenaway this way, then few will want to cooperate with the US spy department. But Flynn got into trouble, first of all, because the easiest way to get close to Trump's closest environment is to use him. The main goal is not Flynn, but the US president. Mueller’s tacticsare perfectly understandable: he conducts persistently business to isolate the president and put him under impeachment. Flynn will be used to not testify r against Trump, but his partners and family members. The first one is the president's son-in-law and the husband of his beloved daughter Ivanka, Jared Kushner. They will probably to use the scheme to him: "testify" against the president, and you, perhaps, will not be touched. In the same way, several other acting members of the Trump team were also threatened, including ex-White House chief Reince Priebus, Steve Bannon and even Donald Trump Jr..". This situation infuriates Trump: he repeatedly threatened to put ex-Secretary of State Hillary Clinton in prison for her numerous crimes, but she got away from this. The FBI only spoke to her once in an informal atmosphere: no oath, no record, that's all. But the FBI has reached his nearest surroundings and it is getting closer to him. So General Flynn lies to the FBI and his life is destroyed, while Crooked Hillary Clinton, on that now famous FBI holiday “interrogation” with no swearing in and no recording, lies many times...and nothing happens to her? Rigged system, or just a double standard?, - he wrote in twitter. He continued in Twitter: many people in our Country are asking what the “Justice” Department is going to do about the fact that totally Crooked Hillary, AFTER receiving a subpoena from the United States Congress, deleted and “acid washed” 33,000 Emails? Nojustice! It is difficult not to agree with this. But here is one more question: who are the judges? Trump has no right to do anything to Mueller, since he is under the protection of Congress. There is an obvious "conflict of interest". Trump has repeatedly pointed it out, but nobody listens to him. Mueller has one goal - to take revenge on Trump for the scandalous firing of ex-FBI chief James Komi. This scandal caused a great damage to the reputation of the powerful structure in the United States. And Mueller's task is not only to punish Trump personally, but his entire family and his few companions, in order to prevent anyone to interfere into the affairs of the American supranational elite in the future. Mueller can wait. He knows that Trump will not get away from him. I remember when a suspect was regarded as innocent until proven guilty in a fair trial. French President Emmanuel Macron uses administrative resources to remove his main political opponent.